Note: This interview originally appeared in Benchpeg, a free weekly PDF newsletter. You can subscribe at http://benchpeg.com. 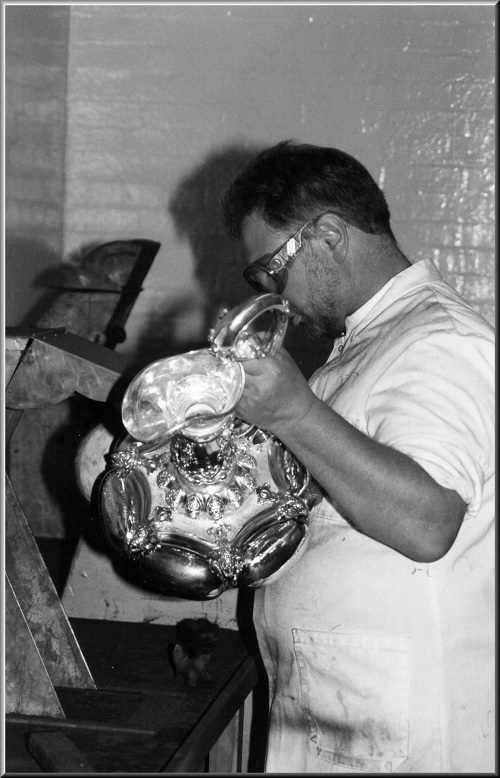 Of all the jewellery and silversmithing trades, polishing is perhaps the most misunderstood, despite being the only trade that is relevant to every item of jewellery. Hours of work by an artisan can be thrown away by bad polishing, and even the best work will not look good unless the quality of the finishing can match it. It’s a dirty, noisy and physical task, and many jewellers are nervous around the high-speed lathes used in modern practice. Fortunately, there are a handful of master polishers who keep this craft alive, through their work and teaching. One of these people is Stephen M Goldsmith FIPG, who started in the early 70’s with a college course, before taking up an apprenticeship with C.J. Vander in Hatton Garden. After a brief stint with Stuart Devlin, he was employed by Nayler Brothers, producing work for Garrard, and later for Asprey when the two companies almalgamated. Stephen now runs his own company, SMG (Kent) Ltd., and works extensively with Theo Fennel. 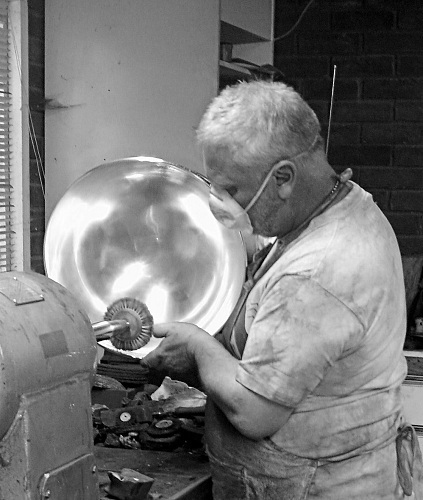 He will literally polish anything, whether it is an antique sports trophy that needs restoring and ageing, or a mirror finished custom mobile phone casing. Luckily for us, he also teaches summer courses at Birmingham School of Jewellery, which will be of interest to any manufacturing or repair workshop. Stephen is running two courses at Birmingham School of Jewellery this summer. You can contact the school on +44(0) 121 248 4584 or email: dawn.meaden-johnson@bcu.ac.uk to book. You started out with a traditional apprenticeship in the 1970’s, but where will the next generation of master polishers come from? Not sure if there will be master polishers in the future as the trade is evolving in a way which defeats the purpose of the craft. We are not artists who should work on their own, our craft is made up of a team of craftsmen, who can excel in what they do individually to achieve one aim together. you know the saying “Jack of all trades, master of none!” I can understand why it is evolving this way, as it is not always practical to employ a polisher full-time now that workshops are getting smaller. That is why I have come into my own, as a freelance polisher (a lance for hire), which is a more practical way to be employed. I have great hopes for The Goldsmiths’ Centre, they are trying to gather master craftsmen to help tutor our next generation of master craftsmen, let’s hope they do not forget polishing. It has not always been accepted as a craft but can certainly make or break the piece instantly. Last November I was tutoring 26 (23 girls) students at the Birmingham City University and I hope I sowed the seed for some of them; the feedback I have received was very good, as before the students met me they thought polishing was boring. When you were an apprentice, you were called “boy” – a tradition that stretches back to the middle ages and beyond. Do you think your work benefited from such a strict hierarchy? You have got to understand that the men I worked with all had done National Service, so were very used to the strict hierarchy. I admit when I refer to an apprentice I call him a boy, but when I am dealing with him I use his name. When you are training you have to make up your mind, are you going to be his friend or master? I don’t think apprentices should be used as cheap labour or slaves but the running of errands and making the tea and cleaning up is very much part of the training. In my travels around different workshops, I see reluctant boys not wanting to carry on this tradition but I feel it helped me become very disciplined in what I do now. 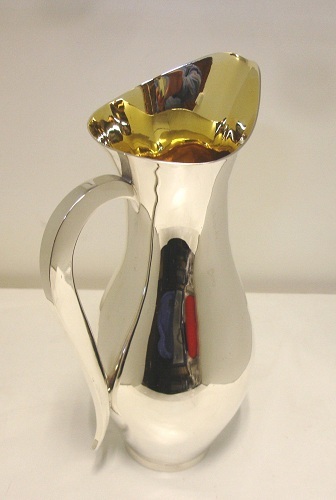 Modern jewellers are used to a high quality mirror finish that was impossible in the past. Do you think this finish has reduced the need for skilled decoration like chasing and engraving in modern jewellery? I have certainly noticed a drop in skill levels – you are very hard pressed to find a chaser now. When I was made redundant from Garrard’s there were 2 chasers, and both left the trade following redundancy. At Theo Fennell they still use both a chaser and engraver in some of their jewellery work as Theo does his best to keep the skills alive. I noticed this year at the Craftsmanship and Design Awards there were high levels of very good chasing and engraving, so it is being supported somewhere. Polishing has evolved too and is not all about getting things bright; I specialise in different techniques. Theo gives me a free reign to come up with ideas and uses them as well. In the past I have had to make silver gilt look like silk, there is an amazing spectrum I can use to create a different effect. Before the Industrial Revolution, polishing was quite primitive. Do you think old techniques like charcoal and burnishing are still important? Yes I think they are important. In fact did you know there is an apprentice training to be a Burnisher under the Goldsmiths’ Apprentice scheme? I must admit I don’t do much burnishing but have some very nice haematite tools to do it. I know beer is involved, perhaps I should do more! I still use pumice stone, charcoal and water of aye stone (Tam O’ Shanter hones) plus I still make my own leather and felt bobs which would originally have been used with Trent sand, but which I now replace with a fine cut pumice powder mixed with vegetable oil. There have been great changes in polishing technologies over the last 1000 years (we don’t use ear-wax any more, for a start). Do you think you would enjoy your work without the benefit of modern, time-saving equipment? I rather enjoy going back in to the past, as the only way I can restore such prestigious pieces is to use the methods of years gone by. As I said I do use haematite burnishers and I use charcoal and ash too. It was part of my training to be able to polish a tray by hand up to charcoal finish, not sure if it would be acceptable today as everything is to do with time and money. You mention ear wax, I would use any lubricant I can put my hands on, to be honest. Did you know charcoal totally changes it character when used with different liquids? You’ve dealt with some high profile pieces, like the Wine Cistern in the Tower of London. Are there particular challenges to working with antique items? The Wine Cistern, or Grand Punch Bowl, is said to be the heaviest recorded surviving piece of English plate, weighing 257.23kg – nearly a quarter of a ton. So yes, this magnificent piece was very daunting; I had to remove the lacquer which was added earlier. I was not allowed to take anything away and worked on site for 11 days, so this was all restored by hand. It was a tremendous responsibility and honour. Basically, with this sort of antique it is a minimum restore but if you look at this job as too big you are beaten already, so you break it down. It was made up of 110 pieces and was taken apart and put together again for me with the aid of my photographs. 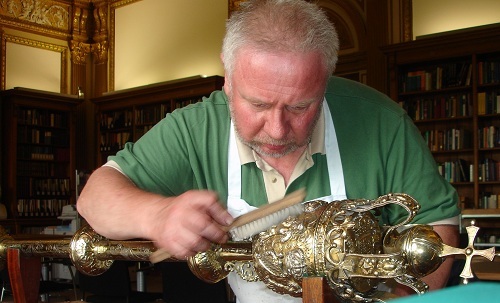 I have also restored the silver gilt parts of Royal Society Charter book with such names as Charles Darwin, Isaac Newton, Alexander Fleming and Albert Einstein, plus their Silver Gilt Ceremonial Mace presented to them by Charles the Second in 1663, in preparation for 350th Anniversary Convocation where Prince William was admitted as a Fellow of the Society. I also restored the sister to the ceremonial mace in the Houses of Parliament. In 1987, Ron Brown then Labour MP for Leith, picked up the mace during a debate on the poll tax, and threw it to the floor. Are large commissions rarer now than they were 20 years ago? Does a lack of these expensive items have a negative impact on skill levels in the industry? I know when the Sultans stopped spending as much it had a negative impact on the trade in the UK and skills were indeed lost. I suspect if the work is still around it goes abroad to be made. As the trade is broken up so much now, how could we raise the capital to make such large commissions? I still get some very high-end bespoke pieces which are made in the Theo Fennell workshop but these are all jewellery. I used to come up against such flights of fancy as a family tree standing in it’s cabinet 12ft high, and a white gold coffee table encrusted with 380 diamonds. CAM milling and rapid prototyping are both growing in popularity amongst jewellers. Do you think there is a corresponding drop in fabricating ability, and does this effect the quality of the final polish? I see the new techniques that are coming along as an aid, much like casting or electroforming. I suspect that when the first spinning was being done, everyone was worried about hand raising. The skill is still carried out but I admit it is very rare now. Barrel Polishing is the same; you can’t beat a hand finished piece. I have polished mobile phones made with CAM milling and they are amazing – so very precise but they take 24 hours to manufacture. These phones were polished to an extremely high standard, and checked by microscope on a HD screen; the system is very clever but this type of work does not put our craftsmen out of work, it just adds a different perspective to what is now achievable. The rapid prototyping is very clever and used at Theo Fennell. It certainly does not put the craftsmen’s job at risk, as I said we use it as an aid to achieve our end. Last year, you worked on a chalice which belonged to the 19th Century Cardinal John Henry Newman. As a religious man, how does it feel to work on such prestigious liturgical objects? Another great honour for me and this chalice didn’t arrive via the usual channels. 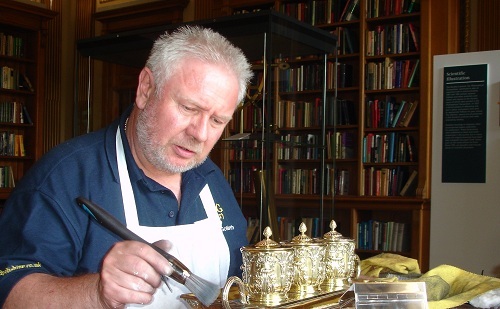 I deal with a few silversmiths’ in Oxford connected with JASSO (Jewellery and Silver Society Oxford), and their tutor used me for the polishing and antique gilding. He never knew I was a Catholic or a Knight Commander of the Knights of the Holy Sepulchre. My workshop is built in the grounds which were formally owed by the monastery at Canterbury, until its dissolution in the 30th year of the reign of Henry VIII. So the Chalice did come to the right place to be restored. I have had the responsibility of restoring many Reliquaries; I also restored the Shrine of St Jude after a fire caused by votive candles on the Feast of St Jude on the 28th of October 2003. My workshop is on my own premises and is quite large. 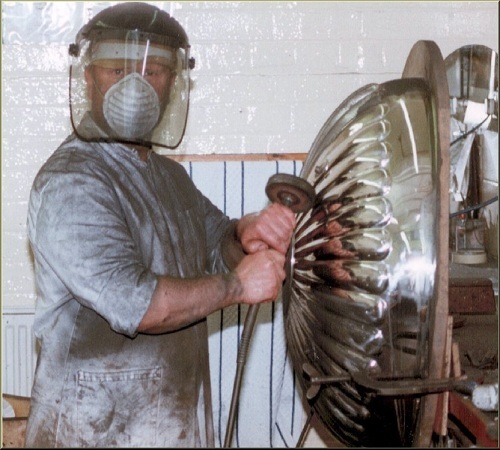 I have a 2hp 3-phase polishing lathe with a very long spindle; it has been my most valued friend for over 30 years now, as Asprey sold it to me, when they made me redundant. I have to use a 3-phase converter and it just plugs into the normal supply. I also have an even longer spindle which I used for the inside of the Premier League cup. The bench is removable for those larger jobs I come across quite a lot. I mainly use B mops and reflex mops and I use some very specialist compositions. The only traditional composition I use is lustre (sometimes called Tripoli). I have a very large ultrasonic machine as dirty work is totally unacceptable. One of the nicest things is my view out of the window overlooking my garden. It is forever changing. Thanks for posting this interview. Yes, the final polishing can make or break a piece and all the hard work that goes with it! The camera never lies even if a client is impressed. I would love to attend the workshop and as crazy as that sounds given I’m in Australia, we are planning a family trip to the UK and Ireland about the same time in 2012. Now…How to convince the family? Thanks agin, the images took my breath away. Hi Suzanne. I think that Stephen does the courses every summer, usually a mix of 3-day and 1-day, so it’s worth considering. Birmingham School of Jewellery is right in the middle of the city, so it’s easy to get to. A matter of either sneaking away or convincing the family that Birmingham warrants their attention. A 1 day workshop is definitely possible. I’ll follow through with the links you provided. I never thought I’d do something like this on our trip! How’s the workshop you buit going? Ah, well. I never got round to building the workshop. I got a residency at Loughborough Uni, and my wife had a baby, so I’ve been busy. On the up-side, I have been busy with medieval jewellery, and I hope to have some time this summer to work on the outbuilding. But having said that, I’m also converting my dad’s contemporary workshop to be better suited to medieval work, so I might be too busy doing that. This blogging project is a victim of it’s own sucess! I never have any spare time any more. So here I am replying to you when I should be waking my son for school, blogging! I’m beginning to appreciate what you are saying. I think I spend as much time blogging about my workshop as I do using it. Just one photo and a line or two turns into a collage and an essay. Why? I don’t know! Your workshop will happen when the time is right. You never know, your child might help you build it. I’m certainly pleased my children were part of me realising my dream space. That’s a nice sentiment. I suppose that I’ll get there one day! And maybe Moo-tron will help me! Looks like I might actually get there! Thank you for posting this interview. I’m really excited & it’s a year away & I still have to book in etc. but my partner said he was OK with my 3 day detour! I actuallly reasearched a few London Universities (including where I trained) & none of them offer anyting as special as a workshop Stephen. My Australian friends think I’m nuts…Of all the things to do in Europe, a class in Birmigham? Ithink you get the gist. So thanks again. That’s great to hear. A jeweller shouldn’t come to Britain without visiting the Quarter (and probably Hatton Garden too). The polishing course is an oppurtunity you might only get in the “Old World” – Stephen is the product of a system of production that doesn’t really exist in the modern global economy. Just Googled the Quarter and will definately go. Hatton Garden I know well and sorely miss! Most of what’s in my laundry was purchased in Hatton Garden. I have every intention of dragging, my daughter at least, there when we stay in London. Yes, it’s all happening. I’ve been in contact with Stephen & the dates are set! Fantastic! Did you arrange to attend one of the courses, or is Stephen doing the tuition privately? To be decided. Depends on enrollments at Birmingham, but tuition at the workshop is also a possibility & a given if Birmingham doesn’t get the numbers. Who knows what will happen with the Olympics around the corner. Both options have merits but I have to think how the family could best be occupied as this is, after all, their big European trip! I’m swaying towards Kent. What do you think? If there is the option of learning in Stephens home workshop, then that’s probably the best bet. On the other hand, Birmingham isn’t far (nothing is far, in England), so I don’t imagine it will cause you problems either way. One thing that is good about Birmingham, of course, is that it’s a fully equipped school, so there are things you can do there that you wouldn’t at his home workshop – eg. when I trained with Stephen, we used the schools sandblaster to compare sandblasting and frosting. But all the core issues can be covered without that sort of equipment. If anyone is interested in attend a Stephen M Goldsmith Polishing Short Course next summer at the School of Jewellery in Birmingham. Please email me of your interest and I will advise the course date and cost when the summer short course programme is launched in March 2012. Interesting to read this interview and comment thread. I was fortunate enough to be able to participate in Steve’s 3-day polishing workshop in Birmingham this year (having made various complicated childcare arrangements!) and found it a really valuable experience. I design and make jewellery semi-professionally and study part-time at the Jewellery School in Birmingham. The 3-day workshop tackled head-on an area in which I needed a big injection of knowledge and confidence and although there’s no way you can cover everything in the time available, I now feel I have a solid grounding in how to approach a wide variety of polishing jobs and a good general insight into the field of polishing work. It was really good to be based in the Jewellery Quarter (good discounts from Walsh’s) and handy to have the resources of the Jewellery School available (technicians extremely helpful). One of the best things though, apart from the course material, was the ‘group as resource’; there was such a wide variety of work brought in by course participants that we all learned a huge amount from each other and learning about each other’s creativity was very stimulating. The only criticism I can think of is that for me, the course was too short! I would also say that to get the most out of it, it is really worth bringing as much work of different kinds as you can, to learn how to go about different methods. Thanks Steve for a great 3 days! Thanks for your comment, Kate – if you use LinkedIn, you might want to put it up as a recommendation for Stephen. Sorry if the post has taken so long to appear; Stephen has just emailed me, and I found your message in the spam queue, amongst the viagra adverts and fake handbag suppliers. Quite why it put you in there is beyond me! It’s encouraging to hear Kate’s experience. The time is flying and I’ll be there in the blink of an eye at this rate! Did the course & loved it!